SS Revelstoke at Downie Creek, 1905. One of Revelstoke’s earliest pioneers, Henry Colbeck came to the Okanagan from England in 1889, and based himself in Kelowna at a time when it was little more than a steamboat call. He found employment on the first steamboat to ply Okanagan Lake, later joining the crew on steamer ‘Penticton’, and then the ‘Aberdeen’ in 1892. Henry’s work took him to all the inland lakes and rivers servicing the Canadian Pacific Railway, including Arrow Lakes and the Columbia River. He worked as chief engineer on the ‘SS Revelstoke’, which operated north and south of Revelstoke from 1902 until 1914. 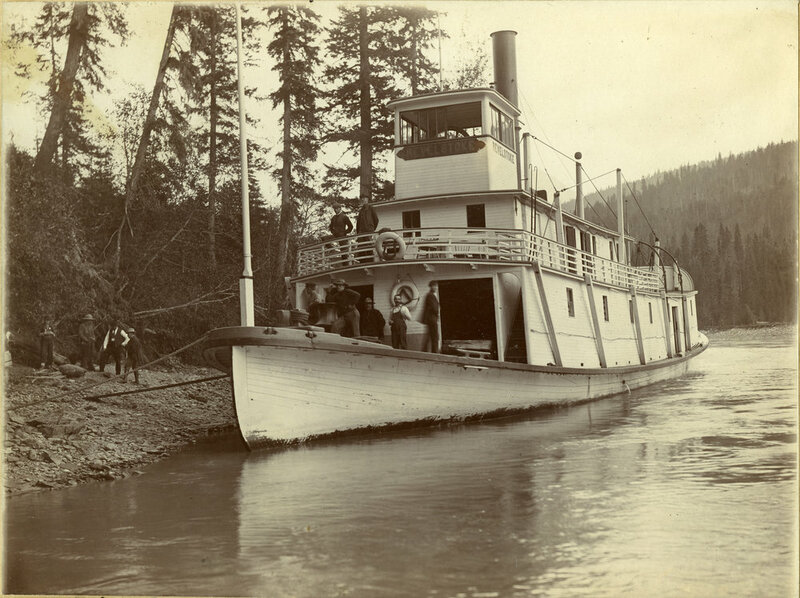 The Revelstoke Navigation Company built the steamboat in Nakusp to restore navigation to the Big Bend country. The rugged little boat had a freight capacity of 40 tons and was licensed to carry 10 passengers. When he retired, Henry and his wife acquired farmland on the Big Bend Highway, just north of Revelstoke. He died at the age of 80, in August 1949. Posted on September 19, 2016 by Catherine English and filed under English, protestant and tagged steamboat okanagan lake penticton aberdeen ss revelstoke Big bend farming CPR henry colbeck Revelstoke Navigation company.